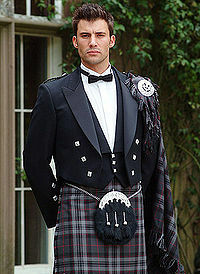 The Formal Kilt often seen as wedding kilts. The formal kilt is one of the most recognized of all the Scottish symbols. It also happens to be Scotland's National Dress, which is recognized across the world. So what makes a formal kilt different from say a casual kilt? Well the first thing is the weight of the cloth used in the making of the kilt, it would normally be sixteen ounce worsted wool, and there would be at least eight yards of cloth. You would accessorize your kilt with a winged collar dress shirt and bow tie, teamed with a Prince Charlie jacket and waistcoat. Some people also choose to wear a plaid over their shoulder, as in the photo below, but this is entirely optional. With such a kilt you would also wear a dress sporran, as opposed to a semi dress or day sporran, both of which are much less decorative. And your kilt shoes would normally be Gillie Brogues, which should be reserved for formal or dress occasions. One of the most common events for a kilt to be seen, is when they are worn as wedding kilts. The kilt is of course an extremely versatile garment, and as well as wearing it formally, after all there is no more elegant an outfit to be found, it can also be used in a more casual setting. To dress your kilt down, simply choose different accessories. For example attending a Highland Games would see you wearing an Argyle jacket without a waistcoat and a normal shirt and tie, a semi dress sporran and normal kilt Brogues. For a more casual look, your kilt can be worn with a Jacobite shirt and chieftain waistcoat, and here a day sporran would be worn. So as you can see when you buy a kilt, you are buying not only the most elegant formal dress available, but also if you wish it to be, a casual outfit that can be worn during the day. If you would like any more information as to where you can wear your kilt, then please drop me a line using the contact us page, and I will be delighted to help.